Gran Turismo for the PSP will be launching later this year as a launch title along side the new PSP Go. Over on the PlayStation.Blog, Penrose Tackie, Gran Turismo European Brand Manager, has kindly posted some questions regarding the new game. From Sony’s E3 Press Conference, we already know that the game will feature 800 cars, 35 tracks, and 60 layouts of those tracks. See below for the FAQ. At Sony’s E3 Press Conference today Jack Tretton officially announced the PSP Go! (even though the details were leaked over the weekend). Tretton cleared up some specifics about the new model including a price and release date as well as hardware clarifications. 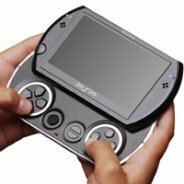 The PSP Go! will launch in Europe and the US on October 1st 2009, along side several new PSP titles including Gran Turismo. The model will retail for $249.99 (approx £150).